Let's talk about one of my biggest obsessions...Mr. MICHAEL BUBLE!! Last night the hubby and I went to see this amazing man in concert here in Austin. 2 Valentine's Days ago Jon bought me tix to see MB in San Antonio and after seeing him last summer, we vowed to go see him anytime he is within driving distance of home. He is such a great performer, so humble, funny, thankful and most importantly, GREAT live! Last year we saw MB 2 days after we had gotten engaged and Michael was talking about his recent engagement and last night he was talking about being a newlywed and we are newlyweds! I think we should have gotten backstage passes for that :-). Michael said he loved Austin and was at Peter Pan Putt Putt and The Alamo Drafthouse yesterday! Dang I why didn't I think of that?! Check out a previous Michael Buble post I did here. Naturally 7 opened up for Michael both last summer and last night, they are so talented! They make all their music with their bodies, no instruements. Check out their video below. Unfortunately they sang the same songs as last year so we didn't get to hear anything new but I will definitely be checking out their music on iTunes. I just can't stop thinking about how fun last night was! We incorporated lots of MB songs into our wedding including our first dance to "You and I" and our last dance to "Me and Mrs. Jones". I was bummed when the show concluded and he hadn't played either of those songs but he came out for an encore and sang Me and Mrs. Jones (which we got up and danced to). We sat next to this family with two little boys (I would guess 6 and 8) and the 6 year old was doing some serious raving/dancing. He was so into the music and we were cracking up watching him shake. He even told us that he had had his kindergarten awards that morning and he got the "computer whiz" award. Kids are so funny! Michael didn't go on until about 9:20p and the kiddos were asleep soon after. We were SO impressed with the stage set up. Check out the 5 video screens on stage. The colors and lighting were so awesome too. We were one of the first rows on the mezzanine level and we thought it was perfect! No one blocked our view and we could see everything! I can't imagine paying an arm and leg for floor seats and not being elevated. The girl beside us let me use her binoculars and I got to check out Michael's sweat beads :-). I did tell Jon that one day I would love to see Michael front row (who wouldn't). How fun! Enjoy these early years :). What a beautiful couple :). YAY for date nights! Esp the ones that are "repeat" of something special! Looks so fun and you are stunning! Love this post! Looks like you had a great time. I love how you took the same picture this year as you did last time; awesome! Have a great day! Sounds like a great date night. I just love Austin too. Fun! I LOVE Michael Buble! =) I'd love to go to one of his concerts. Hope you have an amazing weekend! What a fun date night! And you two are just adorable! love these pics, you are beautiful!!!!! and you need to checkout the site picnik!!!!! its WAY easier than photoshop! its where i edit everything :)!! xoxox hugs!! sounds like a wonderful night!! I guess this is now a yearly tradition??? How fun! Cute pics! 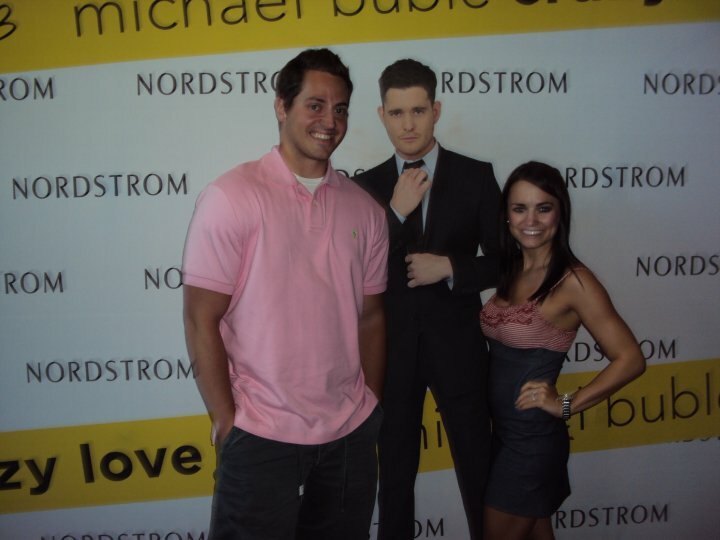 I saw Michael Buble on my 21st birthday! He puts on a great show!! LOVE Buble. Looks like you guys had a great time! what a blast!! I'm sure he puts on a great show! What a fun date night!! Awesome pictures! wahoo for such a fun date night!! adorable pics! I am such a big fan of Michael Buble! So jealous :) It looks like a wonderful date!! You and your hubby are the cutest couple ev'va! Sounds like the PERFECT night! so fun!!! michael buble really is amazing and that's so sweet that your hubby does this for you every year. lucky girl!!! You guys are sooo cute! Looks like you guys had a lot of fun, I'm glad he played one of your songs for you too.